Breckenridge is home ot one of the finest ski resorts in the world. The surrounding county, Summit County, has three more world-class resorts. This is Colorado skiing and snowboarding at its finest. Often ranked as North America's best ski resorts: Breckenridge, Keystone, Arapahoe Basin and Copper Mountain are located in Summit County and provide residents easy access to great skiing spots - and an easy to navigate, free county-wide transporation system. Averaging more than 300 inches of snow per year and lots of sunshine, the skiing is truly unmatched. With a variety of options of homes for sale near these great resorts: ski in ski out, townhomes and slopeside condos, it's easy to become one of the locals who calls Breckenridge home. Interested in learning more about Breckenridge real estate near Summit County's top ski areas? Contact Breckinridge Associates, 970 453-2200. Between Breckenridge, Copper Mountain, Keystone Resort, Arapahoe Basin and not so distant Vail and Beaver Creek resorts, there is plenty of variety for everyone in your family to choose from. 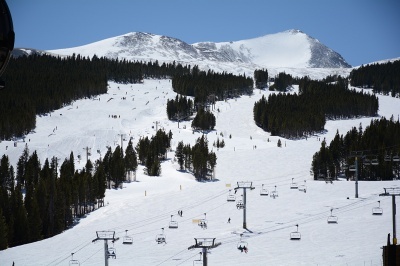 For skiers and snowboarders, Breckenridge Ski Resort boasts a top-rated terrain park and pipe each year. The mountain is one of the best places to learn either sport with great beginner terrain and a state-of-the-art Ski and Ride School. For those that like a challenge, Breckenridge has great groomed and advanced terrain. Enjoy amazing alpine vista views from the top of the Horseshoe Bowl or Imperial lift at 12,998 feet – the highest ski lift in North America. Copper Mountain, Colorado is located directly west of Breckenridge. Although it is geographically close to the city, it has to be accessed by the I-70. Copper Maountin's ski resort is known for its naturally divided terrain, which easily separates skiers and riders by ability. This award-winning trail system is part of the reason Copper Mountin Colorado is a favorite local ski & snowboard resort. Keystone Resort ski area is home to three magnificent mountain playgrounds, which are great for skiing & snowboarding — Dercum Mountain, North Peak and The Outback. For something different, hop in one of the mountain's KATs and take a guided "Cat Skiing Tour" into Independence Bowl for an unbeatable, exclusive ski experience. If you are an adrenaline junkie, or just prefer tricks to trails, the resort's A51 Terrain Park was named one of the best in North America. Just because you have to work doesn't mean you don't get to play. Keystone, Colorado also offers night skiing for those that have to work from nine to five. Aprahoe Basin Ski Area or ‘The Legend’, is famous for the steep terrain, which has been thrilling riders since 1946! In 2008 Arapahoe Basin Ski Resort increased its terrain by 80% by opening Monezuma Bowl on the back side of the ski area. The area offers one of the longest ski seasons in the country – usually opened late October through mid-June. "A-Basin" or "The Basin" as it is referred by locals, will is a rich part of Colorado Ski history and has been thrilling riders for decades. Check out the current Snow Report for Breckenridge.